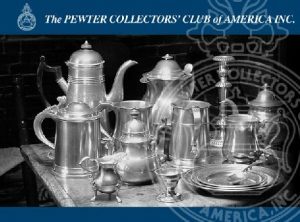 Club History - Pewter Collectors Club of America, Inc. The Pewter Collectors' Club of America, Inc. is an organization composed of over 300 individuals, museums, and historical societies throughout the world interested in collecting antique pewter from America, England, Europe, and Asia. Founded in 1934 and incorporated in 1979, the club encourages research and discussion on pewterers, their marks, their lives, working periods, and locations. The PCCA does not buy, sell or appraise pewter, however individual members may do so but without endorsement or recommendation from the club. Click here for a brief Club History 1934 - 1984. To further the objectives of the PCCA, "The object of the Club is to foster study and research in the field of American pewter and to cooperate in the studies of those interested in English and Continental pewter", for the benefit of it's members as well as non-members and institutions such as libraries and museums the PCCA recently published Collecting Antique Pewter, What to Look For and What to Avoid, in 2006. The club celebrated its 75th Anniversary in 2009. Past President Ellen O'Flaherty presented a brief club history at the national meeting which was subsequently published in the Summer, 2009 Bulletin. Click here to read about the club's First 75 Years.